Capitalists@Work: Consumers where art thou? Mark Wadsworth had a pretty good set of links about the last few weeks retail announcements, on his blog, here. Lots of points raised in the comments about why this recent set of bad news may have come about too. I doubt the most touted two, VAT hike and Fuel prices making people unwilling to drive, have much to do with it. Sure fuel rises are the problem. But only in as much as energy and fuel price hikes have forced consumers to cut discretionary spending. General inflation cash squeezing is the culprit. There's no money left. Officers Club which has gone into administration again, is a victim of better rivals. The average Officers club is 1000- 2,500 sq ft. A Primark or Matalan, selling similar ranges, are ten times that. Republic, Fat Face , Bank etc all have much more popular brands. 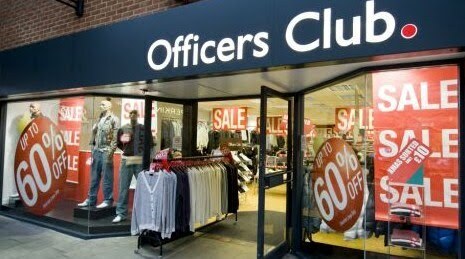 Officers Club traded on discount clothing. That 75% off fools no one any more, when a similar item can be found at H+M for a cheaper price. Officers Club was just a decade old format, unable to compete. Mothercare is more of a worry. They have good store mix of centres, streets and out of town an almost monopoly high street position. Baby wear should be recession proof. Online must be taking its toll. But Mothercare also has the answer for Britain's chain stores. The 9.5% drop in sales hid a 10% rise on its global profits. Mothercare had shown a 22% increase in its foreign business at the end of last year. The firm said it expected the 894-store international division to continue its rapid growth with at least 150 new stores opening in 2011-12. As the UK struggles Chinese, Indian and Latin American domestic consumers continue to rise. A long established retailer, who knows how to market and manage can do very well in the emerging markets. Dunn & Co used to be popular and so was International Stores, or Keymarkets. Bankruptcy happens, as does redundancy. I see no pattern in the tealeaves, yet. £74m given to Comic Relief. ... and a business with owners too stupid to be able to use an apostrophe does not deserve to succeed. IIRC Officers Club was originally Blakes Clothing, called Blakes on the signage. If consumers have no money and 70% of our economy is consumption, then we have a problem. Paying off their debts, that's where. The great deleveraging continues apace. Good. Retailers had it good during the debt bubble. Feast then famine. Sorry about that. Things will start to pick up again from a lower base once people are on a more sound financial footing. Someone tell me what Marks & Spencer is for? "They have good store mix of centres, streets and out of town an almost monopoly high street position. Baby wear should be recession proof." It is. The problem is more about Mothercare. When Mrs T and I were raising the kids, we barely went there. You want basic kids clothes? Asda and Tesco are cheaper and have OK stuff. Formula/bottles etc? Again, Asda/Tesco are cheaper. You want a really nice outfit for the kids? The likes of JoJo Maman Bebe do nicer stuff. You want prams or cots? John Lewis or a local specialist sell for similar prices, but with much better service that the disinterested shop girls of Mothercare. It's a dinosaur from an age when people had few choices, and oin this age, it's being squeezed from all angles. It probably survives on new parents who don't know better. Mr Peston seems to agree with us. So households face a huge squeeze on their spending power this year - which means that weaker retailers face a horrendous time. Budgie. M&S tomorrow. Maybe that question can be answered? Independent baby suppliers have had a very tough time. But Mothercare should be OK. John Lewis manages to do well on its prams/clothing and the are terribly expensive. Mothercare also did a clever tie in with Early Learning Centre. Where do you go to buy toddler + baby toys? I expect they will be ok. They still have a big customer base. Firms will always go under but the incidence now is worrying and no one seems to big to fall. I think it is just the precursor. BE: deleveraging, quite, that is what I see as the format for the next year and possibly longer... I'm only half way there myself, interrupted only by the "necessity" of new car for the wife.